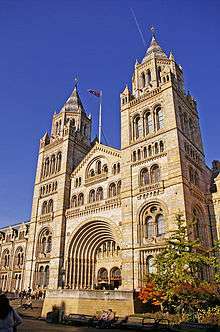 The Natural History Museum in London is a museum of natural history that exhibits a vast range of specimens from various segments of natural history. It is one of three major museums on Exhibition Road in South Kensington, the others being the Science Museum and the Victoria and Albert Museum. The Natural History Museum's main frontage, however, is on Cromwell Road. Although commonly referred to as the Natural History Museum, it was officially known as British Museum (Natural History) until 1992, despite legal separation from the British Museum itself in 1963. Originating from collections within the British Museum, the landmark Alfred Waterhouse building was built and opened by 1881, and later incorporated the Geological Museum. The Darwin Centre is a more recent addition, partly designed as a modern facility for storing the valuable collections. 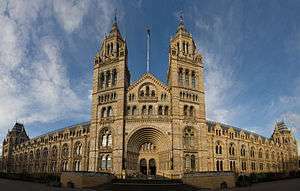 Like other publicly funded national museums in the United Kingdom, the Natural History Museum does not charge an admission fee. The museum is an exempt charity and a non-departmental public body sponsored by the Department for Culture, Media and Sport. Catherine, Duchess of Cambridge is a patron of the museum. There are approximately 850 staff at the Museum. The two largest strategic groups are the Public Engagement Group and Science Group. An 1881 plan showing the original arrangement of the Museum. (Link to current floor plans). The Natural History Museum, shown in wide-angle view here, has an ornate terracotta facade by Gibbs and Canning Limited typical of high Victorian architecture. The terracotta mouldings represent the past and present diversity of nature. The foundation of the collection was that of the Ulster doctor Sir Hans Sloane (1660–1753), who allowed his significant collections to be purchased by the British Government at a price well below their market value at the time. This purchase was funded by a lottery. Sloane's collection, which included dried plants, and animal and human skeletons, was initially housed in Montagu House, Bloomsbury, in 1756, which was the home of the British Museum. Most of the Sloane collection had disappeared by the early decades of the nineteenth century. Dr George Shaw (Keeper of Natural History 1806–13) sold many specimens to the Royal College of Surgeons and had periodic cremations of material in the grounds of the museum. His successors also applied to the trustees for permission to destroy decayed specimens. In 1833 the Annual Report states that, of the 5,500 insects listed in the Sloane catalogue, none remained. The inability of the natural history departments to conserve its specimens became notorious: the Treasury refused to entrust it with specimens collected at the government's expense. Appointments of staff were bedevilled by gentlemanly favoritism; in 1862 a nephew of the mistress of a Trustee was appointed Entomological Assistant despite not knowing the difference between a butterfly and a moth. J. E. Gray (Keeper of Zoology 1840–74) complained of the incidence of mental illness amongst staff: George Shaw threatened to put his foot on any shell not in the 12th edition of Linnaeus' Systema Naturae; another had removed all the labels and registration numbers from entomological cases arranged by a rival. The huge collection of the conchologist Hugh Cuming was acquired by the museum, and Gray's own wife had carried the open trays across the courtyard in a gale: all the labels blew away. That collection is said never to have recovered. The Principal Librarian at the time was Antonio Panizzi; his contempt for the natural history departments and for science in general was total. 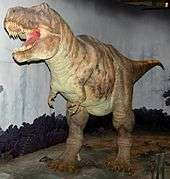 The general public was not encouraged to visit the Museum's natural history exhibits. In 1835 to a Select Committee of Parliament, Sir Henry Ellis said this policy was fully approved by the Principal Librarian and his senior colleagues. Many of these faults were corrected by the palaeontologist Richard Owen, appointed Superintendent of the natural history departments of the British Museum in 1856. His changes led Bill Bryson to write that "by making the Natural History Museum an institution for everyone, Owen transformed our expectations of what museums are for". Owen saw that the natural history departments needed more space, and that implied a separate building as the British Museum site was limited. Land in South Kensington was purchased, and in 1864 a competition was held to design the new museum. The winning entry was submitted by the civil engineer Captain Francis Fowke, who died shortly afterwards. The scheme was taken over by Alfred Waterhouse who substantially revised the agreed plans, and designed the façades in his own idiosyncratic Romanesque style which was inspired by his frequent visits to the Continent. The original plans included wings on either side of the main building, but these plans were soon abandoned for budgetary reasons. The space these would have occupied are now taken by the Earth Galleries and Darwin Centre. Work began in 1873 and was completed in 1880. The new museum opened in 1881, although the move from the old museum was not fully completed until 1883. Both the interiors and exteriors of the Waterhouse building make extensive use of terracotta tiles to resist the sooty climate of Victorian London, manufactured by the Tamworth-based company of Gibbs and Canning Limited. The tiles and bricks feature many relief sculptures of flora and fauna, with living and extinct species featured within the west and east wings respectively. This explicit separation was at the request of Owen, and has been seen as a statement of his contemporary rebuttal of Darwin's attempt to link present species with past through the theory of natural selection. The central axis of the museum is aligned with the tower of Imperial College London (formerly the Imperial Institute) and the Royal Albert Hall and Albert Memorial further north. These all form part of the complex known colloquially as Albertopolis. Even after the opening, the Natural History Museum legally remained a department of the British Museum with the formal name British Museum (Natural History), usually abbreviated in the scientific literature as B.M.(N.H.). A petition to the Chancellor of the Exchequer was made in 1866, signed by the heads of the Royal, Linnean and Zoological Societies as well as naturalists including Darwin, Wallace and Huxley, asking that the museum gain independence from the board of the British Museum, and heated discussions on the matter continued for nearly one hundred years. Finally, with the passing of the British Museum Act 1963, the British Museum (Natural History) became an independent museum with its own Board of Trustees, although – despite a proposed amendment to the act in the House of Lords – the former name was retained. In 1989 the museum publicly re-branded itself as The Natural History Museum and effectively stopped using the title British Museum (Natural History) on its advertising and its books for general readers. Only with the Museums and Galleries Act 1992 did the Museum's formal title finally change to the Natural History Museum. In 1986, the museum absorbed the adjacent Geological Museum of the British Geological Survey, which had long competed for the limited space available in the area. The Geological Museum became world-famous for exhibitions including an active volcano model and an earthquake machine (designed by James Gardner), and housed the world's first computer-enhanced exhibition (Treasures of the Earth). The museum's galleries were completely rebuilt and relaunched in 1996 as The Earth Galleries, with the other exhibitions in the Waterhouse building retitled The Life Galleries. The Natural History Museum's own Mineralogy displays remain largely unchanged as an example of the 19th-century display techniques of the Waterhouse building. The central atrium design by Neal Potter overcame visitors' reluctance to visit the upper galleries by "pulling" them through a model of the Earth made up of random plates on an escalator. The new design covered the walls in recycled slate and sandblasted the major stars and planets onto the wall. The Museums 'star' geological exhibits are displayed within the walls. Six iconic figures are the backdrop to discussing how previous generations have viewed Earth. Backstage at the NHM. The Tank Room within Darwin Centre Phase 1 holds larger fish from the spirit collection, and preparation facilities for them. The Darwin Centre (named after Charles Darwin) was designed as a new home for the museum's collection of tens of millions of preserved specimens, as well as new work spaces for the museum's scientific staff, and new educational visitor experiences. Built in two distinct phases, with two new buildings adjacent to the main Waterhouse building, it is the most significant new development project in the museum's history. 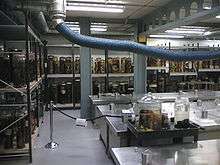 Phase one of the Darwin Centre opened to the public in 2002, and it houses the zoological department's 'spirit collections'—organisms preserved in alcohol. Phase Two was unveiled in September 2008 and opened to the general public in September 2009. It was designed by the Danish architecture practice C. F. Møller Architects in the shape of a giant, eight-story cocoon and houses the entomology and botanical collections—the 'dry collections'. Arguably the most famous creature in the centre is the 8.62-metre-long giant squid, affectionately named Archie. Nature Live event in the Attenborough Studio, Natural History Museum, on 23 January 2012. As part of the museum's remit to communicate science education and conservation work, a new multimedia studio will form an important part of Darwin Centre Phase 2. In collaboration with the BBC's Natural History Unit (holder of the largest archive of natural history footage) the Attenborough Studio—named after the broadcaster Sir David Attenborough—provides a multimedia environment for educational events. The studio plans to continue the daily lectures and demonstrations. One of the most famous and certainly most prominent of the exhibits—affectionately known as Dippy—is a 105-foot (32 m) long replica Diplodocus carnegii skeleton, situated within the central hall. The cast was given as a gift by the Scottish American industrialist Andrew Carnegie, after a discussion with King Edward VII, then a keen trustee of the British Museum. Carnegie arranged for the cast to be created at his own considerable expense of £2,000, copying the original held at the Carnegie Museum. 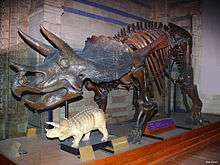 The pieces were sent to London in 36 crates, and on 12 May 1905, the exhibit was unveiled, to great public and media interest (the real fossil had yet to be mounted, as the Carnegie Museum of Natural History in Pittsburgh was still being constructed to house it). As word of "Dippy" spread, Mr Carnegie paid to have additional copies made for display in most of the major European capitals and in Latin and South America, making Dippy the most-seen dinosaur skeleton in the world. The dinosaur quickly became an iconic representation of the museum, and has featured in many cartoons and other media, including the 1975 Disney comedy One of Our Dinosaurs Is Missing. Another iconic display is the parallel skeleton and model of a blue whale. The display of the skeleton, weighing 10 tons and some 25 m long, was only made possible in 1934 with the building of the New Whale Hall (now the Large Mammals Hall), though it had been in storage for 42 years since its stranding on sandbanks at Wexford Bay. Discussion of the idea of a life-size model also began around this time, and work was undertaken within the Whale Hall itself. Since taking a cast of such a large animal was deemed prohibitively expensive, scale models were used to meticulously piece the structure together. During construction, workmen left a trapdoor within the whale's stomach, which they would use for surreptitious cigarette breaks. Before the door was closed and sealed forever, some coins and a telephone directory were placed inside—this soon growing to an urban myth that a time capsule was left inside. The work was completed—entirely within the hall and in full view of the public—in 1938. At the time it was the largest such model in the world, at 28.3 m in length, though the construction details were later borrowed by several American museums, who scaled the plans further. The Darwin Centre is host to Archie, an 8 metre long giant squid taken alive in a fishing net near the Falkland Islands in 2004. The squid is not on general display, but stored in the large tank room in the basement of the Phase 1 building. On arrival at the museum, the specimen was immediately frozen while preparations commenced for its permanent storage. Since few complete and reasonably fresh examples of the species exist, 'wet storage' was chosen, leaving the squid undissected. A 9.45 m acrylic tank was constructed (by the same team that provide tanks to Damien Hirst), and the body preserved using a mixture of formalin and saline solution. The museum holds the remains and bones of the River Thames whale that lost its way on 20 January 2006 and swam into the Thames. Although primarily used for research purposes, and held at the museum's storage site at Wandsworth, the skeleton has been put on temporary public display. Dinocochlea, one of the longer-standing mysteries of paleontology (originally thought to be a giant gastropod shell, then a coprolite and now a concretion of a worm's tunnel), has been part of the collection since its discovery in 1921. The museum keeps a wildlife garden on its west lawn, on which a potentially new species of insect resembling Arocatus roeselii was discovered in 2007. This is the zone that can be entered from Exhibition Road, on the East side of the building. It is a gallery themed around the changing history of the Earth. The Earth Lab is a gallery that centres around geology, and contains specimens of fossils, minerals and rocks. The "Lab Area" is only open to reserved groups and allows an interactive approach to the gallery, allowing the use of microscopes. It is currently the only gallery in the red-zone without step free access. Earth's Treasury shows specimens of rocks, minerals and gemstones behind glass in a dimly lit gallery. Lasting Impressions is a small gallery containing specimens of rocks, plants and minerals, of which most can be touched. The museum runs a series of educational and public engagement programmes. These include for example a highly praised "How Science Works" hands on workshop for school students demonstrating the use of microfossils in geological research. The museum also played a major role in securing designation of the Jurassic Coast of Devon and Dorset as a UNESCO World Heritage site and has subsequently been a lead partner in the Lyme Regis Fossil Festivals. 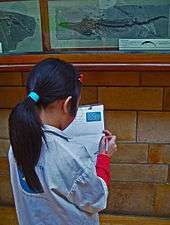 In 2005, the museum launched a project to develop notable gallery characters to patrol display cases, including 'facsimiles' of luminaries such as Carl Linnaeus, Mary Anning, Dorothea Bate and William Smith. They tell stories and anecdotes of their lives and discoveries and aim to surprise visitors. In 2010 a six-part BBC documentary series was filmed at the museum entitled Museum of Life exploring the history and behind the scenes aspects of the museum. The Natural History museum combines museum's life and earth science collections with specialist expertise in "taxonomy, systematics, biodiversity, natural resources, planetary science, evolution and informatics" to tackle scientific questions. In 2011 the Museum led the setting up of an International Union for the Conservation of Nature Bumblebee Specialist Group, chaired by Dr. Paul H. Williams, to assess the threat status of bumblebee species worldwide using Red List criteria. 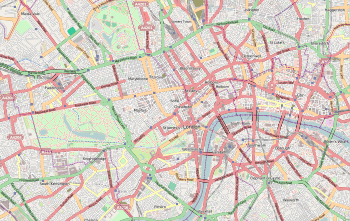 The closest London Underground station is South Kensington — there is a tunnel from the station that emerges close to the entrances of all three museums. Admission is free, though there are donation boxes in the foyer. Museum Lane immediately to the north provides disabled access to the museum. A connecting bridge between the Natural History and Science museums closed to the public in the late 1990s. The museum is a prominent setting in Charlie Fletcher's children's book about unLondon Stoneheart. George Chapman, the hero, sneaks outside when punished on a school trip; he breaks off a small dragon's stone head from a relief and is chased by a pterodactyl which comes to life from a statue on the roof. The museum plays an important role in the London-based Disney live-action feature One of Our Dinosaurs Is Missing; the eponymous skeleton is stolen from the museum, and a group of intrepid nannies hide inside the mouth of what is supposed to be the Blue Whale model (in fact a specially created prop – the nannies peer out from behind the whale's teeth, but a real Blue Whale is a baleen whale and has no teeth). Additionally, the film is set in the 1920s, before the Blue Whale model was built. British fantasy author China Miéville based the plot of his 2010 novel Kraken: An Anatomy around the theft of "Archie" from the museum's Darwin Centre by a mysterious squid cult. In the 2014 film Paddington the villain is a taxidermist at the museum. She kidnaps the bear Paddington intending to kill and stuff him, but is thwarted by the Brown family after scenes involving chases inside and on the roof of the building. In the first episode of the third season of the TV series Penny Dreadful (2014 - 2016), the main character Vanessa Ives (Eva Green) visited the museum when her psychotherapist told her to "go somewhere different". There, she meets Dr. Alexander Sweet (Christian Camargo) who is a zoologist and the Director of Zoological Studies. The museum was then frequently seen in the following episodes as Vanessa and Dr. Sweet's relationship flourishes. The NHM also has a sister museum, located at Tring, Hertfordshire. Built by local eccentric Lionel Walter Rothschild, the NHM took ownership in 1938. In 2007, the museum announced the name would be changed to the Natural History Museum at Tring, though the older name, the Walter Rothschild Zoological Museum is still in widespread use. ↑ "Visits made in 2015 to visitor attractions in membership with ALVA". ↑ "Museum governance". The Natural History Museum. Retrieved 14 March 2010. ↑ Harrison, Lily; Caldwell, Lindsey (22 April 2013). "Duchess Kate to become patron of three new charities". Today News. ↑ Harrison, Keith; Smith, Eric (2008). Rifle-Green by Nature: A Regency Naturalist and his Family, William Elford Leach. London: Ray Society. pp. 265–266. ISBN 9780903874359. ↑ Gunther, Albert E. (1975). A Century of Zoology at the British Museum through the Lives of Two Keepers, 1815–1914. London: Dawsons. ISBN 9780712906180. ↑ Gunther, Albert E. (1980). The Founders of Science at the British Museum, 1753–1900. Halesworth, Suffolk: Halesworth Press. ISBN 9780950727608. ↑ Barber, Lynn (1980). "Omnium Gatherum". The Heyday of Natural History: 1829–1870. London: Cape. ISBN 9780224014489. ↑ Bryson, Bill (2003). A Short History of Nearly Everything. London: Doubleday. ISBN 9780385408189. ↑ "Interior of the NHM". Royal Institute of British Architects. Retrieved 14 December 2010. ↑ "Decoration". nhm.ac.uk. Archived from the original on 8 June 2011. ↑ "Museum 'cocoon' prepares to open". BBC News. 2 September 2008. Retrieved 20 January 2009. ↑ "Giant squid goes on display". nhm.ac.uk. ↑ "First ever display of Thames whale skeleton". nhm.ac.uk. ↑ "Mystery Insect Bugs Experts". Sky news. 15 July 2008. ↑ "Museum of Life". The Natural History Museum. 2010. Archived from the original on 30 August 2010. Retrieved 5 January 2011. ↑ Paul H. Williams (1986). "Environmental change and the distributions of British bumble bees (Bombus Latr.)". Bee World. 67: 50–61. ↑ Museum entrances, Natural History Museum. ↑ O'Connor, Joanne (5 December 2014). "On location: Paddington". Financial Times. Retrieved 1 January 2015. Dr Martin Lister: A bibliography by Geoffrey Keynes. St Paul's Bibliographies (UK). ISBN 0-906795-04-4. (Includes illustrations by Lister's wife and daughter). The Travelling Naturalists (1985) by Clare Lloyd. (Study of 18th Century Natural History — includes Charles Waterton, John Hanning Speke, Henry Seebohm and Mary Kingsley). Contains colour and black and white reproductions. Croom Helm (UK). ISBN 0-7099-1658-2. Wikimedia Commons has media related to British Natural History Museum.